I hadn’t seen this one coming, I must admit. Over the past few weeks, there have been rumours that John Huntsman Jr., former governor of Utah, current US Ambassador to China and moderate republican, will jump into the 2012 presidential field. I hadn’t believed any of the speculation for a second. Huntsman may be a republican, and a young, charismatic, intelligent one at that, but he’s a key member of the sitting president’s foreign policy team. What is more, he’s an environmentalist who supports civil unions for gay couples. 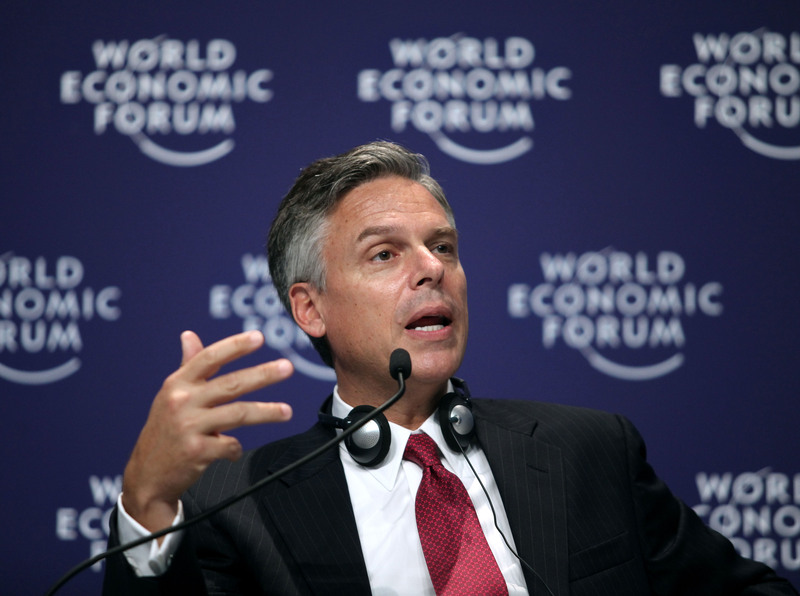 The White House expects Jon Huntsman, the U.S. Ambassador to China, to resign his post this spring to explore a bid for the Republican presidential nomination, top Democrats said. GOP allies of Huntsman have already begun laying plans for a quick-start campaign should the former Utah governor decide to enter the ill-defined Republican field. While Huntsman has no direct involvement in it, a group of operatives that could eventually comprise his strategy team has set up an entity called “Horizon PAC” to serve as a placeholder for his political apparatus. The PAC will be run by Susie Wiles, a Florida-based Republican strategist who recently managed the campaign of newly-inaugurated Gov. Rick Scott. Over the holidays, the ex-governor met with Sen. John McCain, whose 2008 presidential run Huntsman backed early on. In a discussion with the senator, who is the ranking member of the Armed Services Committee, about a variety of issues, Huntsman made plain that he was eyeing a White House campaign in the near term, according to a source close to the senator. I can see a narrow path to victory for Huntsman. While his moderation is generally seen today as dooming him in the republican primaries – President Obama joking “I’m sure that him having worked so well with me will be a great asset in any Republican primary” – that could change in the next six to twelve months. We seem to be moving towards a more bipartisan, conciliatory political climate, with Speaker Boehner cooperating well with the president thus far. Since the shooting in Arizona, people on both sides of the aisle have made efforts to sound less angry and brashly partisan. There is an increasing realisation that the Tea Party is at least as much of a liability as it is an asset to the GOP. In that kind of political atmosphere, rather than the one that reigned in 2010, a moderate technocrat with executive and foreign policy experience, who speaks fluent Mandarin to boot, could actually have a shot at the republican nomination. It’s a long shot, granted, but he’s more authentic than Romney and more competent and presidential than Huckabee, and he could potentially prevail if the conservative base is divided. And, honestly, he’d frighten the pants off President Obama, because he could actually win in November 2012. Update: Huntsman has just resigned from his ambassadorship and is now likely to explore a presidential bid.